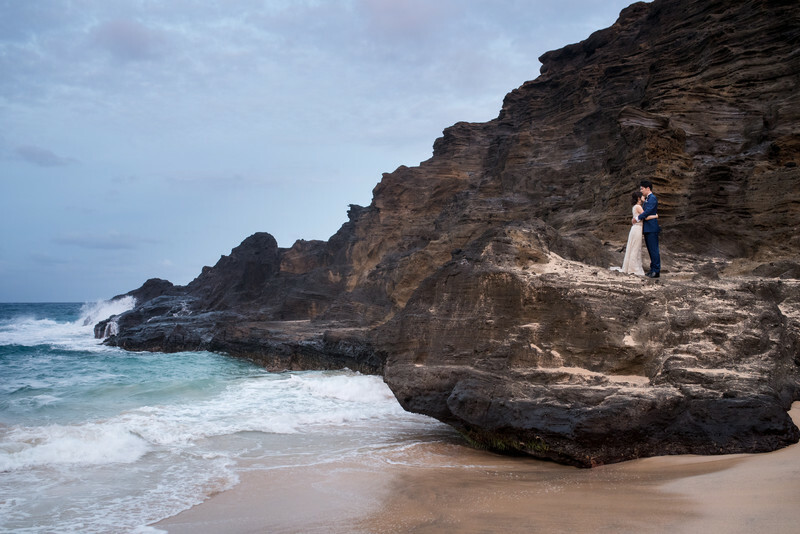 Oahu has many locations for portraits -- each offering unique landscapes and lighting conditions. While some locations give you a chance to watch the sunrise or sunset, there is always a chance to see amazing colors during those times, regardless of the location you choose. For example, you might not be able to watch the sun dip below the horizon from the east side of the island, but you can still see amazing colors in the sky at sunset. Prior to your session, please be sure to apply sun protection liberally and frequently if you plan to get some sun. Retouching rates can be quite high if tan lines need to be removed, so please protect yourself and don't be too anxious to get your Hawaiian tan before your session. 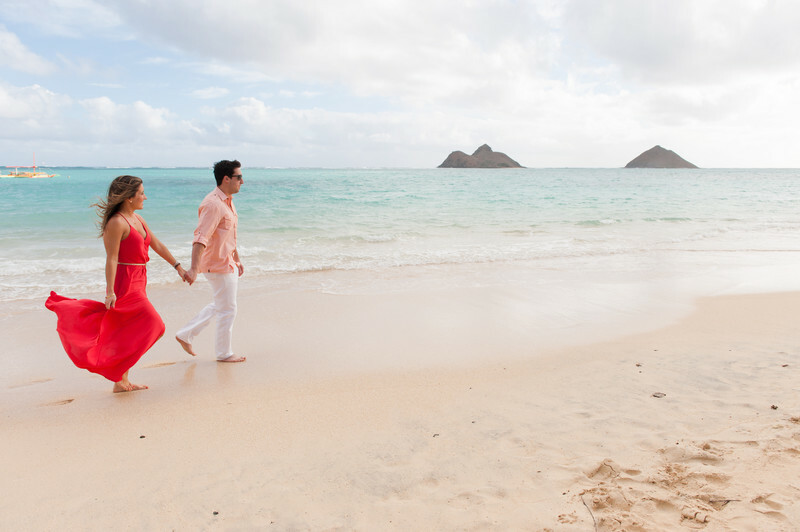 Hawaii's trade winds are quite nice on a warm day, but it often presents a challenge for clothing and hair during a photo session. Consider putting your hair up if you think the wind will be a factor. Please don't hesitate to contact me with any additional questions and/or location considerations. This is a popular beach for bodysurfing and bodyboarding among locals as well as visitors. The rocky area on the west side of the beach offers a unique landscape away from the surfing crowd. Don't let the name deceive you -- this is a beautiful location with sand, rocks, cliffs, and a cave. 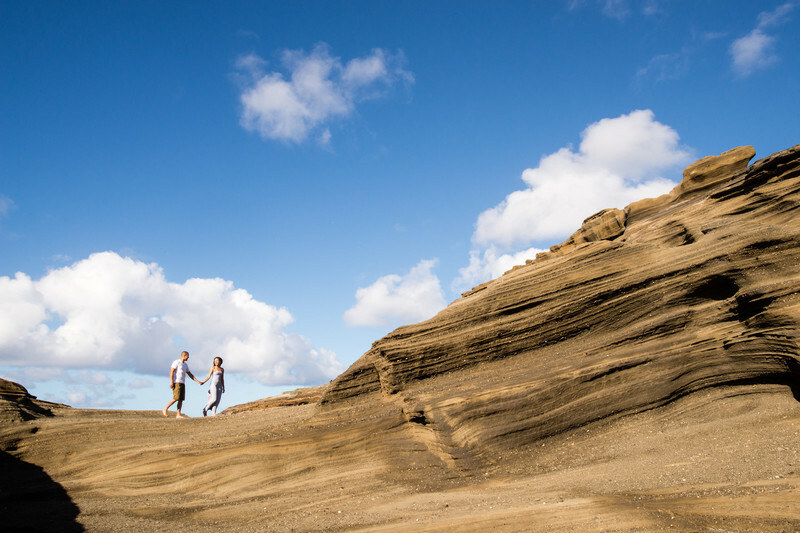 Parking is at the Halona Blowhole, and requires a short hike downhill. This beautiful sea cliff area is within a mile of Cockroach Cove. Getting to this area requires some downhill hiking on some loose rocks, so it can be a bit dangerous to go down at times. This area has a wide open space with a lot of grass. An easy hike along a trail leads to a stony beach with some sand and rocks. A good choice if you don't want too many beachy photos. Waimanalo Beach is a large beach on the east side of Oahu. Afternoon light is soft and very flattering for portraits. There are many trees in this area, providing additional variety for backgrounds. Lanikai is a beautiful beach with clear water and small waves. It has become popular in recent years, and can be crowded in the afternoon. Lighting is great in the early morning and late afternoon. If you want an opportunity to watch the sunset, the North Shore area should be considered. Along this area are many beaches, some with rocks and tidepools, and one special location with amazing banyan trees. 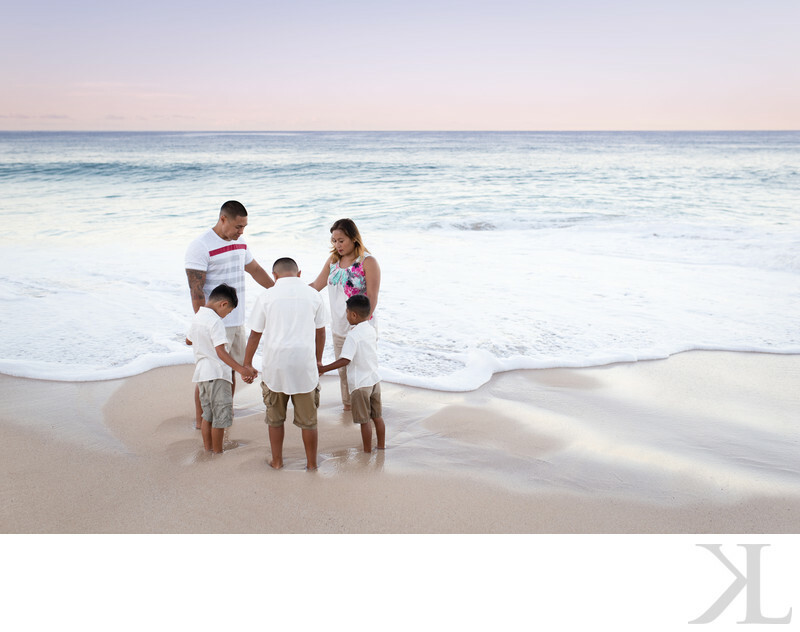 If you're staying in Ko Olina, this beach is located just a few miles away. On a typical weekday morning, you might have this beach all to yourself. 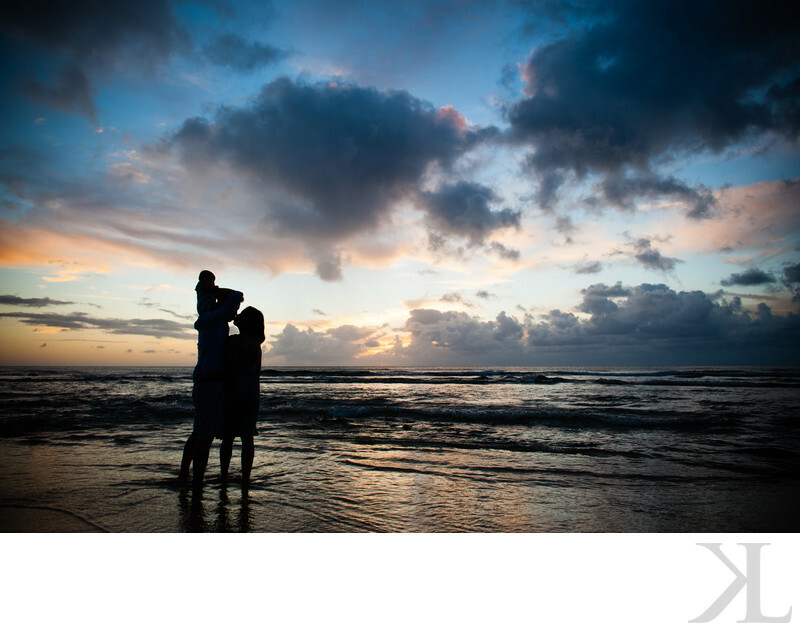 Waves can be big, so don't expect to go in the water if you have young children. 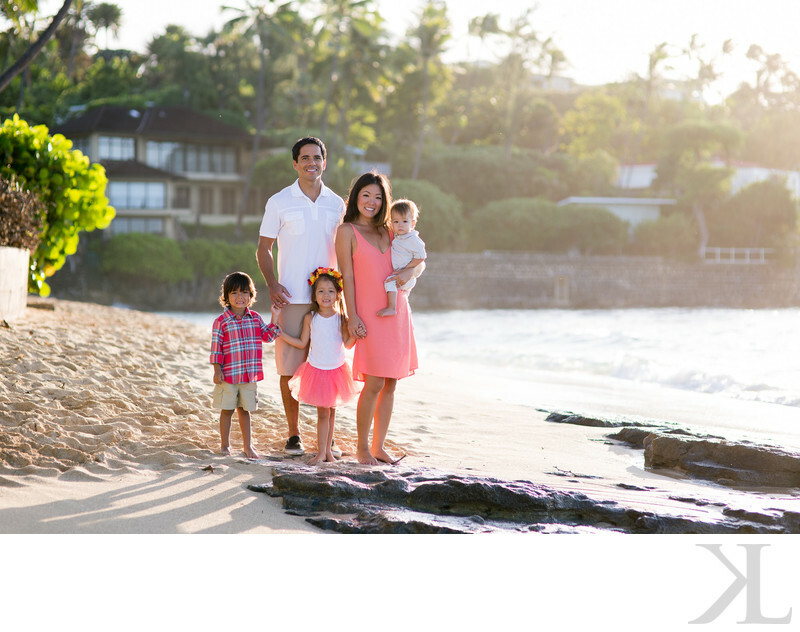 There are two locations in Kahala that are great for portraits -- Kahala Beach Park and the beach at Kahala Hotel & Resort. Mornings are usually not crowded at all, and afternoon crowds are minimal. 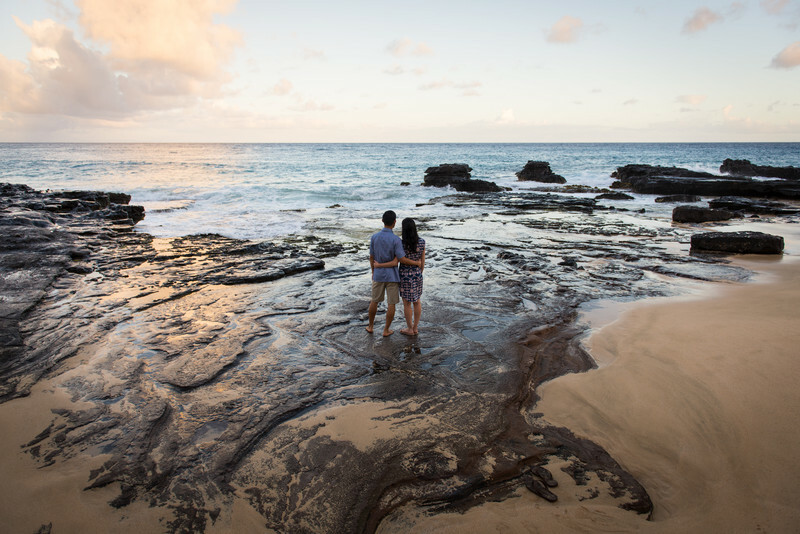 Located in the residential Diamond Head/Kahala area is this hidden beach known primarily by locals only. Low tide reveals interesting rocks for additional variety on your photos. Great for sunrise sessions; sunset is also great, but locals tend to be around in the afternoons. And while this is an affluent neighborhood, this isn't a great choice if you definitely do not want homes in the backgrounds of your photos.